Normally I would start this blog post with the lore of the new lockbox. Something along the lines of how Jim Darkmagic couldn’t control the Wand of Wonders and now these new shiny lockboxes are showing up all over Neverwinter. This time we’re going to do things a little bit different because we have changed the design of Lockboxes going forward so we will skip the lore and dive right into it. New lockboxes will still be opened by an Enchanted Key (Keys are available from the Zen Market or, if you’re a VIP member, you get one new key for free every day). The difference is in the reward structure. All of the lockboxes up until now (which all remain unchanged with this update. 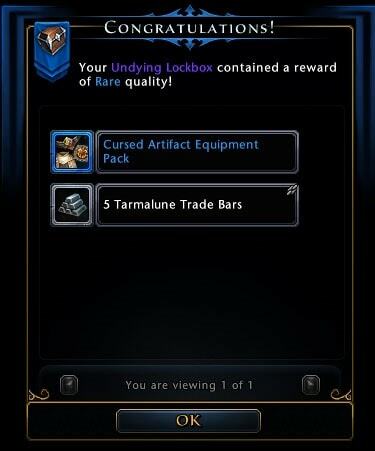 Existing lockboxes will still function as they did before with the same rewards) awarded either a Legendary Mount, Epic Mount, Epic Companion, or a sub pack such as an enchanting pack or mount pack, and then had Trade Bars. Sub packs had some draw backs. Mainly the fact that in order to create enough variety in those packs for them to usable, many of our lockboxes felt the same as one another. It also was a challenge to make enough types of packs that the majority of players would be excited by. When taking a look at those lockboxes we decided to approach it in a different way, without sub packs, where players always had a chance at all of the rare items in each pull and make it far more likely that a player would always get at least one item that was useful to them when opening a lockbox. That’s a lot of description and not many pictures to help explain the difference. Let’s do a comparison of the Undying Lockbox and the New Opportunities Lockbox to show this in action. The inspection scrolls on a bit further to show the rest of the Utility Rewards, but this already shows the big difference between the lockboxes. Instead of getting a sub-pack which then gives you one or two rewards, you get all of the rewards directly from the lockbox itself. As we changed the content of the lockboxes it also gave us the ability to make the screen more interesting and move around the elements. On the left is the items you’ve earned so far in opening the current group of lockboxes you’re clicking through. On the right is the items in this particular lockbox, one from each reward group. 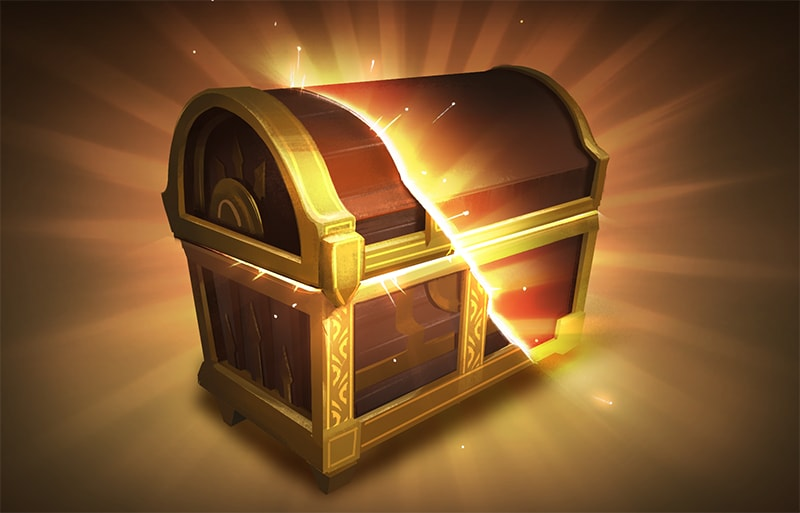 Overall this new lockbox style should feel better, lead to greater diversity between lockboxes, and allows for a chance at multiple top tier rewards in the same opening. This lockbox is available on PC with the launch of The Heart of Fire! Acquisition Incorporated nearly led you to your own demise from a Deepcrow. Now’s your chance to have one of your own. 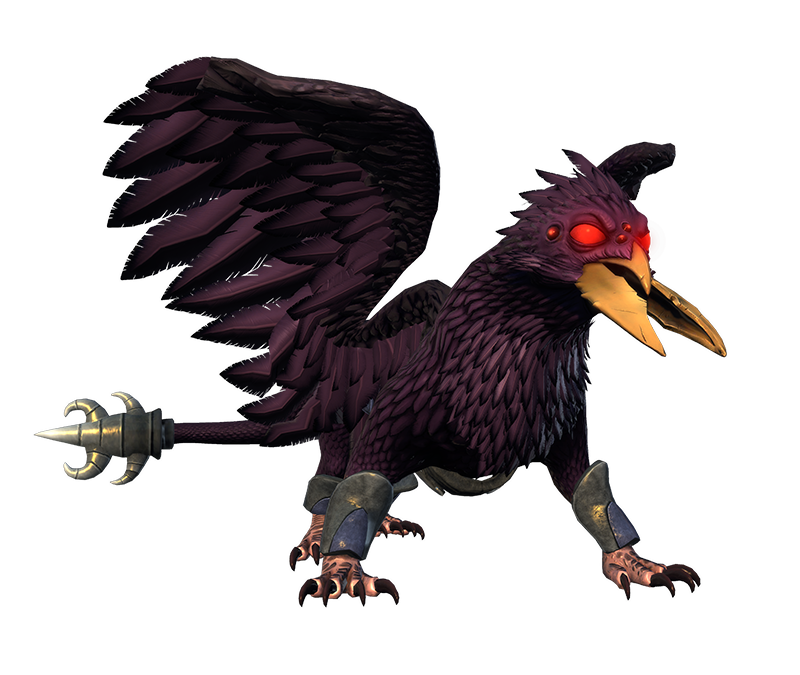 If a large, person eating, Deepcrow is a bit too much to handle, the New Opportunities Lockbox also contains a Deepcrow hatchling augment companion. This little critter will follow you around as it works to hatch from its large egg. It will grant you a bonus to your Power stat when it is travelling with you. 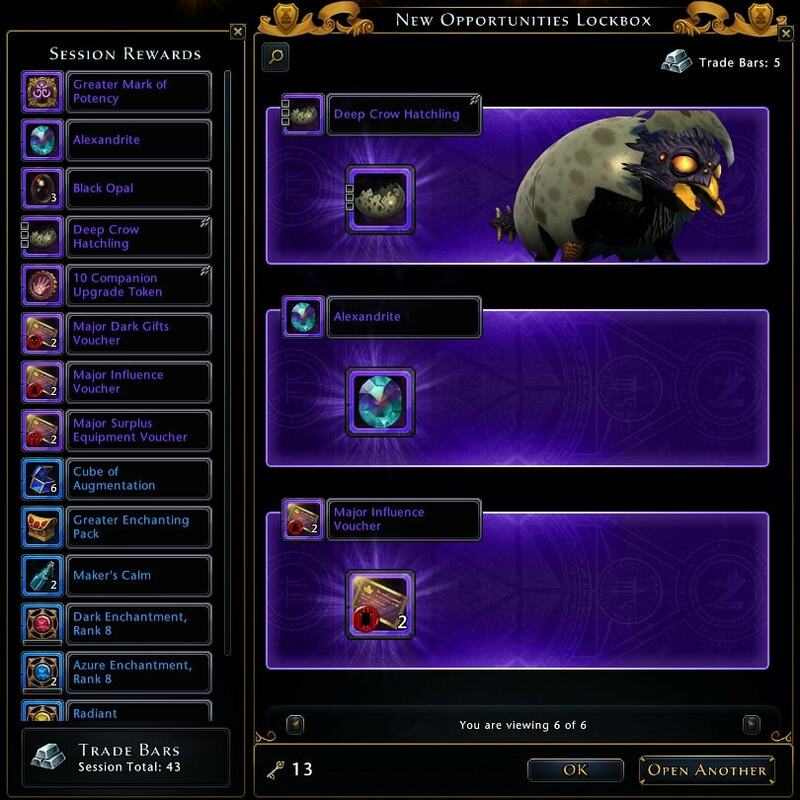 Besides terrifying and cute Deepcrows, the New Opportunities has a variety of rewards including Demogorgon’s Girdle of Might, and the Utility category has a variety of rewards to help get you going on the new Professions system. But wait there’s more! We wanted to launch the new style of lockbox on all platforms simultaneously. That means that console gets a new special lockbox as well. Glorious Resurgence lockboxes will no longer drop in game with our new style of lockboxes (existing Glorious Resurgence lockboxes will continue to function as they did and have the same rewards they last had). Instead there will be a second lockbox in each module which has a selection of past mounts and companions. In addition to these packs, the Reborn Lockbox will have reward such as the Shard of Orcus’ Wand, and a Utility Rewards group more focused around mounts and companions, but still has the chance at getting a Legendary Tool for professions. We hope you enjoy the new form of lockbox and hope you have a wonderful adventure exploring the Heart of Fire update.